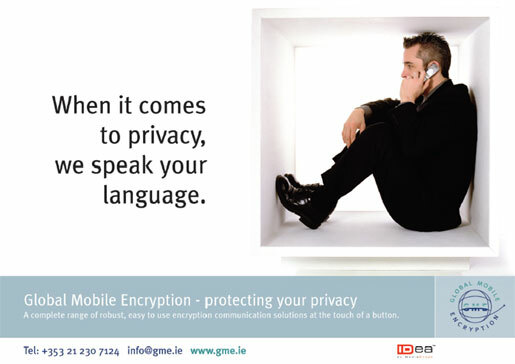 InterComms talks to Finbarr Ring, Chief Executive Officer Global Mobile Encryption (GME) and Richard Straub, Chief Executive Officer of MediaCrypt AG, about the two companies’ work together on secure voice communication over wireless and fixed networks. Finbarr Ring has over 20 years experience in the Telecommunications and Information Technology sectors. He helped found Global Mobile Encryption (GME) as a start-up venture in August 2002. He joined GME from SITA, the USD1.5bn global service provider to the airline sector, where he worked as Vice President and Sales Director at the company’s headquarters in Geneva. Previously, he worked as Director of Operations for Jetphone, a joint venture between BT and France Telecom providing in-flight telecommunications services. He has also worked with KPMG as a management consultant and held various management positions with BT in the UK. An Irish national, Finbarr holds a degree in Electrical Engineering and a Masters in Business Administration. Richard P. Straub is a 22-year veteran of managing sales and marketing for international high-technology companies. He joined MediaCrypt in 1999, after 17 years at Compaq/Digital Equipment Corporation, where he was a member of the management team and held a range of senior management positions, including such international posts as Director Sales/Marketing for the Operations Management Services Division Europe, Director of the Desktop Operations Management Practice and Internet Operations Management Practice for Central Europe, Northern and Southern Europe. In the early and middle 1990s, he was responsible for the Digital’s participation in The Open Software Foundation (OSF) and X/Open Company, Ltd. He was elected chairman of X/Open’s Marketing Manager Group in 1992 and nominated to X/Open’s Open Systems Requirement Board in 1993. Straub is also co-author of the ‘Open Systems Handbook – A Guide to Building Open Systems’, published in 1994 by the Institute of Electrical and Electronics Engineers, Inc. (IEEE). He studied Business Management at the University of St. Gallen, Switzerland. Q: Why was GME formed? FR: GME is a start up company formed in August 2002 in Cork with the support of a Swiss venture capital company. Our aims are to provide low-cost, innovative encryption solutions primarily for government clients, but also the private sector. A key aspect of the business plan is that we start with a blank sheet of paper and go to the market to establish exactly what our customers want. We then identify companies who have a best of breed in that product and approach them to license their design to GME. Typically we would incorporate some hardware changes before embedding our software and producing the products ourselves. For the integrity of the encryption system it is imperative that we have dedicated hardware and software fully under our control. In this way we can always be sure that the encryption is not adversely affected by hardware or software designed by someone else for some purpose other than encryption. Q: You’ve selected the IDEA algorithm for you products. Why was that? FR: IDEA was a perfect fit for us. The algorithm has a very small footprint, which enables us to use it in handheld devices over a GSM network and provide phone quality voice with very little discernable delay. Our experience with the algorithm has certainly validated our initial observations and it fits into our overall strategy of buying-in best of breed products that are proven in the marketplace. MediaCrypt is attractive to us for reasons other than the performance of the product itself. We went through a testing process looking at algorithms to find one that fitted well with our specific needs. Not only do MediaCrypt provide you with an algorithm and the theory behind the algorithm but they also provide excellent implementation codes, an extensive test suite so we know the implementation works in the final product. Another vital factor for GME is that they also have a particular emphasis on product evolution. MediaCrypt have decided that they want to make IDEA’s development as flexible as they can for customers. In the future their ‘Fox’ project, will allow licensees such as ourselves, the ability to come up with a customised version of the algorithm but still retain the benefits of having proven algorithm beneath it. We have a very open working relationship that helps identify other opportunities for collaboration. Q: How did IDEA start life? RS: . 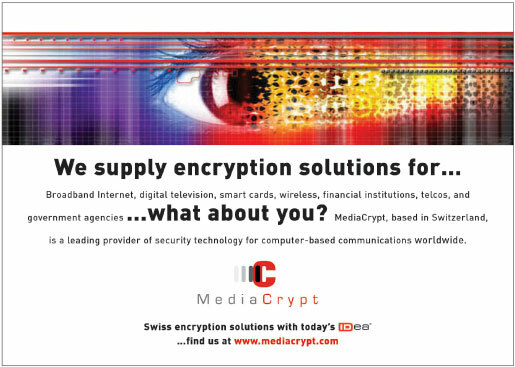 MediaCrypt is a joint venture between two Swiss companies; Ascom and the Kudelski Group to pursue opportunities in securing transmission, as well as content and copyright protection. IDEA did not come out of MediaCrypt’s ‘kitchen’. It was developed by Ascom in the early 1990s and was the first encryption algorithm for PGP. At that time it was considered to be a very elegant solution in terms of its design and the way it looks at encryption. It is small efficient and secure, which is important. It is a very mature and well studied encryption technology and is extremely solid. It is not known to have ever been cracked. So like a good wine, which improves with age, IDEA has been around for a while and people really trust it. The IDEA algorithm is also supported by peer review. It is a published algorithm. Although, you may know the formula it does not help in solving the encryption. Proprietary algorithms are not always disclosed. The fact that IDEA is a public encryption algorithm shows how confident we are in its security. Q: Who are the current users of IDEA and what do they use it for? RS: Securing e-mail is one of the most popular areas where IDEA is being used (PGP). Another is Internet banking. Credit Suisse and UBS have implemented Internet banking with the IDEA encryption algorithm. At the enterprise level there are various applications, including securing websites, railway communications using GSM-R for mobile transmission, mobile communications and pagers. Swissphone and Deutsche Telekom are successfully using IDEA, as well as government organizations. Q: What are the basic issues in encryption for secure voice applications? RS: Solid encryption is the basis but the encryption algorithm is not everything. It is more the case of getting the implementation right. You need a nice and solid implementation, which is the key to everything. GME are doing a good, solid implementation. Q: What does GME estimate to be the size of the market for secure communications? FR: If you look at the traditional encryption market it has mostly consisted of sales to government and state bodies. I would estimate that on a global basis the market for mobile products is up to 50,000 units. We aim to get 20-30% of that market by the end of our third year. The size of the market for our two desktop products – the PSTN, a basic analogue device and the gateway device, which provide access to analogue public network and IP, is roughly of the same order. Q: What are the issues for a company entering this market? FR: Historically the market for strong encryption products has been government based for three reasons. First, the sale and distribution of encrypted communication have been heavily regulated. In the past decade that has been become less so with the advent of the greater liberalization in the free circulation of encryption products. A key development in this area was the Wassenaar Agreement. This has allowed for the ready export and circulation of products amongst OECD and related countries. The products are still regulated but it is a lot easier to export than it was in the past. Secondly, the cost has been very high. The third reason is less obvious. Newer technology and developments in encryption techniques have enabled the process of using and administering encryption products to become simpler. In the past, products have tended to be complex and burdensome to use. We have listened to customers demands that products be as simple to use as possible. With GME products, the only additional demand that we place on our customers is to press a single button if they want to make an encrypted call. When they use the products, they find that the quality of voice is comparable to what they would find on normal telephone call. Q: What is the road map for GME products? FR: Our objective is to provide an encrypted communication solution for all the major network technologies. With the three products we have available we satisfy three networks: the PDA for access over GSM and PSTN network, the PSTN goes over the analogue public network, Gateway provides an encryption solution over IP and analogue. For the PDA we will also be launching a CDMA version. The encryption software is embedded in the body in all the encryption software and hardware held in the body of the PDA. The PDA does not have any inherent network connectivity; this comes via a plug in Compact Flash card. A GSM Compact Flash card allows you to make and receive calls over GSM network. You can do that in the clear or encrypted. If you plug out the GSM Compact Flash card and put in a CDMA Compact Flash you can make and receive calls over a CDMA network. Similarly if you put in WLAN connection you can make a VoIP call over wireless LAN. We have launched it with a PSTN and GSM capability. Over the next 15 months we will add CDMA, Bluetooth and Wireless LAN. We are also looking to extend PSTN into support for ISDN. We also have an interest and we have spoken to a number of equipment providers in providing satellite solutions as well. We are looking to launch a satellite product around the middle of 2005. Q: What is the regional focus? FR: The traditional government market is very well established with sales extending back several decades. Timing is particularly fortuitous for us in that we are coming into the market when the previous generation of encryption in the government sector is coming to the end of its useful life. Our main focus is the Middle East, Africa and Central and Eastern Europe though we have begun to enter the South American and Far Eastern markets also. There are already a number of established encryption providers solutions within Europe who primarily manufacture and sell within their home markets. We are looking for markets without an indigenous encryption manufacturer and consequently will be primarily export driven. Our distribution strategy is to sell through local distributors who have a track-record of successfully selling into our target markets. One of the major disadvantages we have found in the existing market is that there is very little local support for these types of products. We want our customers to have all the benefits of having a local company that support them quickly and in their own country. We have now signed up distributors in Central and Eastern Europe, Africa, South America and the Middle East. Q: What makes you different from traditional suppliers? FR: We have gone to the market place to find out what people want. They have told us that they want something that is easy to use and convenient both for them as individuals and as an organization. That is what we deliver. Because of our business model we can deliver a product to market in 18 months compared with the norm in the industry which is anything between three and five years. The products we are selling now have 2003 technology and we are building them to last. Our distribution partners are a vital part in delivering the level of service that has so far been missing in the marketplace. We have invested heavily in ensuring that our distribution partners deliver customers with the level of service necessary to allow customers to purchase our products with confidence.